When talking about innovation, food is usually not the first sector that comes in mind. Despite this, innovation in food is taking place faster than ever. IoT, Machine Learning and Virtual Reality are just a few elements that will affect and change the food sector in the next 5 years more than the past 50 years together. 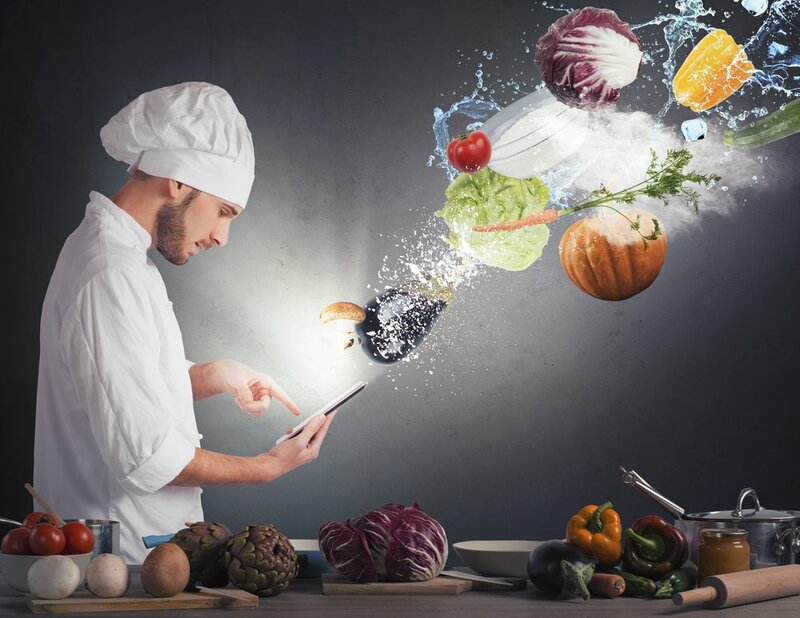 However, innovation in food is not implementing new technologies only, many new cooking techniques have also been developed in the last years to improve customer experience. Let’s dive into what the last trends in food are and how doing business in this sector will be impacted by them. I have been working in the food and beverage industry for almost 18 years now, traveling back and forth between Italy and the US. This made me understand how the concept of innovation can be intended in different ways depending on where you are and who you are asking. The average American customer has an idea of innovation in food that most of the time is completely different from that of an Italian customer. This is greatly due to deep cultural differences, that become even deeper when it comes to food. The approaches that the respective customers have in this sector are so different that the development path of the industry has taken two paths. Innovation in the US is mostly related to combining new tech solutions to every possible sector, food included. This is why the latest solutions that restaurants have been adopting involve mobile apps, electronic payments, Wi-Fi, customer data collection and faster delivery services. Technology makes and will continue to make everyday interactions with the clients increase, which, at the end, will result in more profits. These solutions are affecting not only the customer experience, but also the management of the business itself, making it more automated than ever. Real-time sales performance, computers that dictate cooking time, automatic order scheduling to suppliers and employee shifts to name a few. All of these new technologies are going to impact everyone, from the clients to the employees. Think about the voice ordering solution that companies such as Domino’s have started adopting. The client is going to talk to a “smart speaker/virtual assistant”, while the employee… well, there will no longer be an employee to take your order anymore. But wait, one could argue that these changes are taking place in every sector, not just in the food industry, so what differentiates this field to others? The answer is, of course, food. Together with all the new technologies mentioned above, food has been evolving too. In the United States, attention has been focused on two particular aspects: how the food is served and the quality of the ingredients. The main business model that has been taking over the market in the last decade is defined as “Fast Casual” and combines these two aspects together to meet the customers’ needs and requests. Concepts like Chipotle and Shake Shack have grown exponentially from the beginning of 2010s. The elements that characterize this concept focuses on a better quality of food than fast food restaurants and a cheaper and faster service than casual dining restaurants. These factors are usually (but not always) joined by the “Build Your Own” option which allows the client to make his custom meal and is more efficient in volume and stock management from a restaurant perspective. The growing success of this format has been attracting a lot of investment funds from the private sector and VCs, and whoever will be able to integrate successfully new innovations and a winning service concept will be on the top of the list of these investors. This is how the American food and beverage businesses are answering to their new customers’ needs and the evolution of the market. At the same time, the food industry is evolving everywhere else too but in a different way. Another approach to meet different type of customers has been evolving in Italy, one of the most relevant countries when it comes to food trends. The evolution of the Italian cuisine has been focused on a different type of innovation, techniques and not technologies. Italian chefs have been offering to their clients old recipes renewed with new techniques. Enhance the flavor of traditional ingredients and increase the nutritional benefits through new and improved techniques is the new “mantra” that restaurant entrepreneurs and owners are following. The two examples above perfectly explain this trend and these are how pizza and pasta have evolved in the last years. These two dishes have always been a core part of the Italian traditional cuisine, classic recipes with base ingredients affordable for everyone. Now they are being renewed in a more sophisticated and technical way. Pizza for example, has been introduced on the “Tasting Menus” of starred restaurants as “Gourmet Pizza” concept, whose offer includes new types of dough and yeast. New cooking methods have also been developed and applied to the pizza making process, steaming, boiling and frying the dough are all new ways of making pizza that give it different shape, consistency and obviously the taste. Chefs have started pairing it with fine wine and desserts, increasing the quality of the pizzerias to the level of Michelin restaurants. The same evolution has affected pasta. All the traditional recipes have been revised in new forms that involve longer and more complicated cooking processes. Italian chefs are pushing the limits of traditional cooking techniques beyond the imaginable. The aim is to make a further leap in the quality and taste of those classic ingredients that seemed to have reached a state of "saturation" in the kitchen. Sophisticated techniques such as steam cooking and vacuum cooking to name a few, are now applied not only to fine products, but also to the typical ingredients like pasta, rice or vegetables, that each of us has in our kitchens. Furthermore, by combining new kitchen tools offered by technology and their knowledge of the product and science behind it, chefs are now able to offer a simple “pasta in bianco” where the only simple thing is the name. New processes and cooking techniques are studied in detail and can take days to be completed, but it is through these new processes that the chefs keep to innovate behind the scenes to make us discover new emotions at the tasting time. A knowledge of chemical principles is required to develop these techniques and to understand how the products react to the different cooking methods. This is why more and more chefs are developing a background of these skills. These differences in how innovation is intended depending on where you are, underline once again the importance of understanding your customer needs before all. If your clients require fast, affordable and good quality food or if they are looking for new tasting experiences, everything comes down to understanding the demand and adapting your offer consequently. This will make the difference between those businesses which will grow, those which will just survive and those which, unfortunately, will die, in the next years.